On Sunday 9 July 2011, South Sudan seceded from Sudan and became the world’s youngest country. The conflict in Sudan has been well documented, but little attention has been paid to the crafts and arts of Sudan. Few people realize what a rich reservoir to the aromatic past Sudan is, and that Sudan once played a vital role in history of Perfumery and the trade of aromatics. Even today Sudan has a thriving aromatic culture with a unique way of making perfumes. To get a perspective of Sudan’s rich aromatic culture one has to look back into the History of Sudan and its important geographical position that served as a route of passage for people, trade, and ideas since ancient times. The culture of Sudan is a melting pot of fusion between different cultures. The immigrant Arab culture and the neighboring cultures (mainly Egyptian and West African cultures) have strongly influenced Sudanese culture. Their influences are especially evident in the North, West and East of the Sudan. Their influence was less felt South Sudan. Sudan emerged from some of the world’s oldest civilizations and served as a crossroad for others, namely ancient Egypt, Christian and Islamic civilizations. Its history extends further back than 7000 B.C. The fabled kingdoms of Kerma and Kush (also referred to as Nubia), and many now also believe Punt (South-East Sudan – Beja lands) once rose and fell within the borders of Sudan. 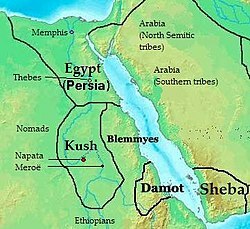 At one point, the kings of Kush ruled the entire Nile Valley from the Mediterranean Sea to the Highlands of Ethiopia. Due to its geographical position, for the15 centuries that the Kerma civilization flourished it was an extraordinarily prosperous empire ruled by a series of powerful kings. During this time Kerma established itself very successfully as a middle-man between sub-Saharan Africa and Egypt that controlled the flow of trade in luxury goods to Egyptian Pharaohs, which included gold, ivory, precious woods, wild animals, slaves and of especial interest to us aromatics. Sudan and South Sudan, shares borders with nine different states; Egypt, Libya, Chad, Central African Republic, Zaire, Uganda, Kenya, Ethiopia, and Eritrea, and is separated by the Red Sea from Saudi Arabia and Yemen. Sudan’s geographical position thus provided access to trade routes north, south and east to the Red Sea. If indeed the location of almost mythical Punt was in the region of the Gash Delta, extending from the port of Suakin or Aqiq on the Red Sea coast, west to the Atbara River and south into northern Ethiopia most of the international trade in aromatics in antiquity occurred within the borders of Sudan. Punt was also mentioned in the Bible, and ancient Romans called it Cape Aromatica. Greek geography, the Meroitic kingdom was known as Ethiopia. The Nubian kingdom at Meroe persisted until the 4th century AD, when it fell to the expanding kingdom of Axum. Meroe was the seat of the great caravan route from North Africa and westward across the Soudan (Ethiopia). From Meroe eastward extended the route by which the wares of southern Arabia and Africa were interchanged. The great wealth of the Kushites arose from this net work of commerce which covered the world of the historical times. The trade routes can still be pointed out by a chain of ruins, extending from the shores of the Indian Ocean to the Mediterranean. The cities Adule, Axum, Napatan, Meroe, Thebes and Carthage were the links in the chain. So often in written recipes, techniques that are considered self-evident and common knowledge in the time period, is not recorded and thus becomes lost in time. As the culture of Sudan is almost a microcosm of synthesis of the most influential cultures in the cultural evolution of humanity, I believe that the processes used by the Sudanese in their perfume making contain many of those lost secrets of the ancient art. The burning of incense to invoke spirits and to dispel negative influences appears throughout cultures and history of the world, whereas the use of perfume oils is traditionally used to make “holy,” or to anoint. Sudan is a wonderful time capsule for the traditional use of incense and perfumes. For a long time I wondered how to capture the burning incense note, and the wonderful scent of fragrant wood smoke, naturally; the techniques used by the Sudanese gave me the answer. More about that later in this article. There are two popular methods of incensing in the Muslim Sudan; the bakhra and the takhriga. Bakhra is a sheet of white paper on which the fakir writes astrological formulas, magical seals, or numerical squares, with holy verses from the Quran. A bakhra is burnt in a mubkhar (incense burner), alone or with frankincense and ambergris. The patient bends over the incense burner, covered in a cloth and inhales the fumes. The process is usually accompanied by incantations, a spitting cure, or other forms of treatment. The Sudanese bride is traditionally dressed in red. The Zar spirits themselves are said to be ‘red winds’, and the colour red is associated with heat, fertility, and earthly rebirth. Red mediates between black and white and reflects that the possession rite is essentially a transitional ritual. It is interesting to note that most of the Zar participants are women between the ages of 35 to 55, which are a major time of transition for women and a time when women needs to find self expression through creative means. The Zar is also an important ritual drama, which encapsulates historical events and personages. The zar parties, in addition to being therapeutic in nature, are believed to serve social functions as well. The zar parties provide women with music, dancing, food and a relaxed atmosphere in which they can let off steam. Most commonly, scholars note that in Zar possession, women find an escape from the world dominated by men. The women are able, through Zar, to do things she cannot do in ordinary life. The zar bori parties, also known as midans or dastur (plural dasatir), involve lengthy preparations setting the scene for the musical extravaganza and dancing sÉances. The zar house is characteristically crowded, and filled with strongly scented fumes and perfumes. The novice, the participants, and the audience are all dressed in their best clothes. The zar novice and devotees join in the dancing. A typical Zar incense or Bakhur Al-Zar generally contains ‘udiya (Aquilaria agallocha Roxb. – Agarwood), luban jawi (“Frankincense of Java “– Benzoin), Frankincense, Commiphora pedunculata, sandalwood, mastika (mastic gum), ghasoul (Salicornia sp. ), murr higazi (Commiphora abyssinica), blended with traditional Sudanese perfumes. Presenting beauty on a daily basis is the means by which the devotee appeases the spirits, and consequently maintains power given to her by the zar spirits. According to Baqie Badawi Muhammad in her fascinating paper “The Sudanese Concept of Beauty, Spirit Possession, and Power,” beauty is an essential element in the Zar cult. The burning of incense and the use of perfumes therefore also play an important role in creating an aesthetic environment that pleases the Zar spirits. 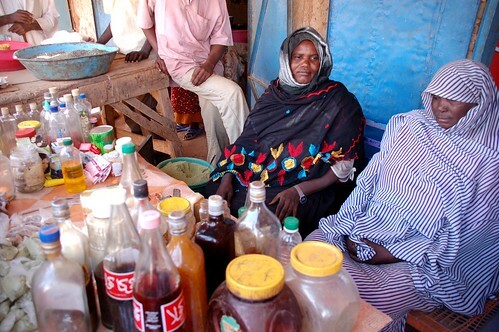 Sudanese women have unique local perfumes and cosmetic rituals, such as; Khumra, dilka, Karkar, Dukhan, and henna decoration. These cosmetics can only be used by women who are married or about to get married. I find the techniques and ingredients used fascinating as it represents for me a slice in the history of perfumes. It could well represent how perfumes were first made in ancient Egypt and the Nubian civilization. Before I delve into the traditional perfumes and cosmetics, I will cover some of the ingredients that add a historical perspective. “Mahlab” or “Mahleb” is an essential ingredient in both Khumra and Dilka (I will cover Dilka separately.) 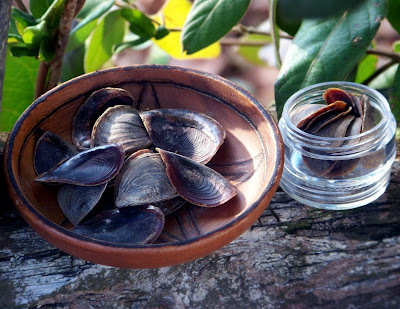 Mahleb was once widely used by Arabian and Persian perfumers who also used it as an ingredient for incenses, and although no mention is made of its use in ancient Egypt I see no reason why they would not also have used it, as the spice is widely used in Egypt. I have to wonder whether the “red berries” in the famous Egyptian Reliefs that depict some of the aspects of perfume making on the walls of the tomb of Petosiris from the early Ptolemaic period could not have been Mahlab cherries? Mahlab is the kernel of a species of wild cherry, Prunus mahaleb, also known as the Perfumed cherry, or St. Lucie cherry. Mahaleb cherrry is native to Morocco, Iran, Iraq, Armenia, Pakistan, Caucasus, Soviet Middle Asia, Central and Southern Europe. The major producer of Mahlab today is Iran, followed by Turkey and Syria. Mahlep cherry is seen as the mother of cultivated cherries, since the mahlep cherry is often used as the grafting stock for table cherries. Sandalwood (Santalum album) and Sandalwood oil (Sandaliyya) is widely used as an aromatic ingredient. A crude Sandalwood oil is also sold. Women also make an infusion by scraping sandalwood chips with a knife into coconut or palm oil and macerate it until the oil takes on a red tint. The oil is used to keep the skin soft, moist and protected. It also is used to stop the skin looking ‘grey’. Frankincense, Myrrh and Mastic gum has also been a widely used commodity from this area. Mastic gum is thought to be “sntr” incense mentioned in the ancient Egyptian texts of the Punt expeditions by some scholars. The species of Pistachio found in Africa is Pistacia aethiopica, distributed in Somalia, Eritrea and Southern parts of Ethiopia, and Pistacio chinensis var, falcate also occurs in Ethiopia, Somalia and Sudan. The odour emitted by Commiphora samharensis is similar to some of the Pistacia species and it is speculated that it is possible that it could have been used as an alternative source of “sntr” or interchangeably by the Egyptians. The myrrh species found in the region are; Commiphora myrrha, C. erythraea, and C. samharensis. Commiphora gileadensis or opobalsamum is widespread in Western and Eastern Sudan and both the twigs and resin is used. Dilka is used by women as an exfoliating scrub that leaves the skin soft and perfumed. Like Khumra and dukha, dilka is only allowed to be used by married or about to get married women. Unmarried girls are only allowed to use dilkat-burtuqal (orange paste). The dilka dough is prepared in much the same way as the basis of Khumra and takes about 3-5 days. The principal ingredients are however, sorghum or durra (durum) flour. Alternatively, millet flour or even orange peel is used. It is called dilka murra (bitter) if unscented and hulwa (sweet) if scented. Powdered ‘Mahleb’ (Prunus mahaleb) seeds and cloves are soaked in water and let to steep for several hours. It is then strained through a fine strainer, the seeds discarded and the watery extract gradually added to the flour and kneaded by hand into soft dough. To the dough, different amounts of finely ground fragrant woods are added such as tahlih wood (Acacia seyal – shittah tree), shaff (Terminalia brownie), and sandalwood, as well as powdered mahlab, qurunful (Cloves), and dufr (operculum) and sometimes zabad (Cuttle-fish bone.) This basic mixture is called al-marbou’ and if luban (Frankincense) and simbil (Spikenard) are added then it is called al-makhmous. This paste is spread on the inside of a bowl (traditionally wooden). The bowl is then inverted over a container or a dug hole with smoking aromatic woods such as shaff, sandal, and talh. The durra paste is enriched with the fragrant smoke of the woods. At regular intervals, a handful of the powdered fragrant blend mentioned above is added and kneaded in, until the material is cooked and the right fragrance achieved. Once the paste has cooled to this will be added kabarait, a blend of traditional scents such as musk, surratiyya (Crude oil of cloves), zait sandaliyya (Crude sandal oil), or majmou (clove and sandal oil), and baida (mahleb oil) may be added, as well. To make a special dilka, sugar, favourite liquid perfumes, and zait al-ni’am (Ostrich fat) are also added. Popular perfumes often added are Bint el Sudan and Reve d’ Or (1889) but more about that later. This is then scraped from the bowl and sometimes further scented by spreading it on top of a mesh and smoking it with bakhur (incense). Otherwise, it is formed into small balls and preserved in huqs (airtight wooden pots) until needed. The smoking also cures the dilka as it stays preserved longer than other types of similar paste. The technique generally used to prepare the traditional perfumes is unique. The smoking of ingredients is unusual and I have not come across it in any other perfumery techniques. First a paste is made from the powdered dried ingredients such as mahleb seeds, cloves, nutmeg, dufr, sandalwood and musk, and sometimes even dried apples studded with cloves and orange peels are added. This paste is then smoked in a charcoal fire with pieces of sandalwood and local aromatic woods. After smoking the paste Frankincense, myrrh and various liquid aromatic oils is added and the smoked paste is then infused in oil to produce the perfume. 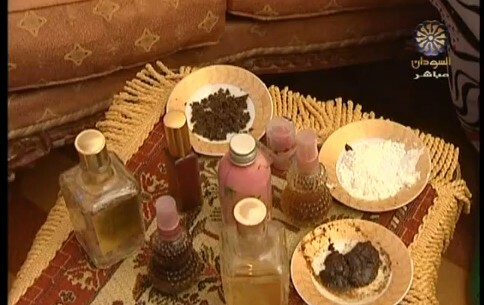 The making of perfumes is an important part of Sudanese wedding rituals. The preparations for the wedding perfumes start about a month before the wedding by the women of the bride’s relatives and friends and it is a skill that is passed on by through family members. The following video shows how Khumra is made. Dukhan, or smoke bath, is a beautification ritual practiced by women in northern Sudanese provinces. This ritual is also forms a part of the traditional Sudanese wedding preparations. Although women insist on the benefits of dukhan for health reasons such as curing bodily aches, cleanliness, health, and for restoration after childbirth, it has strong associated with sensuality and eroticism. It is believed to boost sexual gratification. The Himba women also use a smoke bath on a daily basis but for cleansing purposes. Chips of sandalwood coated in sugar are also burned in a small clay dish, which is covered by a dome “cage” of light flexible wood (mabkharah). Clothes are spread on top of the cage so they absorb the fragrant smoke—another tradition done only by married women. Out of this rich aromatic culture of Sudan was born what is perhaps world’s all time best selling perfume; Bint El Sudan. First introduced in 1920, by the 1960s and 1970s, it was the biggest selling non-alcoholic based perfume in the world and a separate alcoholic-based version was also released. An average of 5.7 million bottles of Bint El Sudan is now produced every year for Africa, according to Nicholas Evans, the IFF fragrance sales manager for Africa. Alison Bates tells the wonderful story of how her grandfather was instrumental in the birth of Bint El Sudan on her blog. According to the story Sudanese nomads approached him with vials of precious essences with which to produce an oil based perfume for the Muslim market. The rest of the story is legendary and Bint el Sudan became one of the most recognized fragrances of Africa: The original distribution network was still via camels caravans carried by merchants traveling all over north and West Africa and into the Middle East. It was even used as a currency in the area, and as a result of the value placed on Bint El Sudan counterfeits became rife. The packaging today has been designed to counter act counterfeits but the original label design remains as recognizable as ever. The original Bush firm has changed hands several times since her grandfather’s day. It was bought by Albright & Wilson in 1961; became part of Bush, Boake and Allen (BBA) in 1966; and in 2000, the U.S. conglomerate International Flavors & Fragrances (IFF) bought out BBA and took over the rights to the Bint formula. Nicholas Evans kindly sent me some samples of Bint El Sudan to smell and filled me in with more back ground stories. So what does Bint El Sudan smell like? The marketing description is; “A blend of floral odours with the emphasis of jasmine, lilac and lily of the valley, with undertones of woody notes supported by musk, amber and moss.” The cute12ml bottles sells for about 1 dollar in Africa. They also sell little triangular bags of Bint el Sudan. The scent is instantly recognizable as one I have often smelled in public places, also a scent associated with shower-fresh. The fresh Lily of the valley top notes quickly dissipate into notes of rose that I associate with Turkish delight, or sweet rose water with a sparkle of Jasmine Grandiflora note which drifts into notes of sandalwood soap, and finally settles in a base of musky amber. I do not smell much oak moss though. This year the First Festival for Sudanese Perfumes was held with the theme of ” Sudanese Perfumes: Towards Internationalism,” in Khartoum. 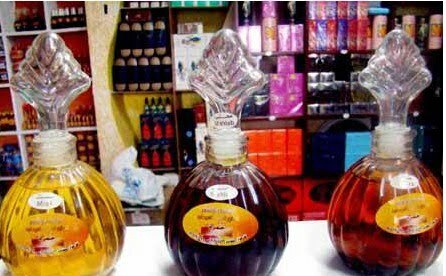 The Chairperson of the Sudanese Centre for Development of the Businesswomen, Mrs. Samia Shabo said the Perfumes’ Festival is an attempt to shed light on the various kinds and good quality of Sudanese perfumes as well as their ability to compete other perfumes in the international markets. You will need a dish in which to burn the resins and woods. I use a flat ceramic bowl that often is the base for ceramic flower pots. Or you can just burn it in a hole in the ground. A heat resistant bowl that will fit just over, or within the burning bowl. Palm fat, or any fat that you will use for enfleurage. Any resins, aromatic woods, spice or dried herbs that you love the burning scent of. 1. Melt the fat inside the bowl and roll the melt fat against the sides so that it is a thin layer rather than just a layer on the bottom of the bowl. Allow it to cool and become hard. 2. Place the charcoal inside the burning dish and light it. Make sure that it is hot before adding the aromatics. When it is giving a good smoke place the bowl with the layer of palm fat over it. 3. Keep checking to see that the fat is not melting or that there is still enough smoke. 4. Keep adding aromatics for more scented smoke until the fat has been thoroughly impregnated with the scent. 5. Then you scrape the scented fat from the bowl and put it inside a jar with enough alcohol to cover. Shake it daily until you feel it is strong enough. You can also recharge by straining the alcohol and placing more scented fat in the alcohol. That way you can make the extract as strong as you want to or even blend different smoky scents. It is really fun to experiment with different kinds of aromatics. My favourites so far are of course Frankincense, Omumbiri and Camel thorn wood. While the cleanest Europeans were only taking baths every six months. They have the nerve to put it out there that black people stink.